I was kindly sent the rivetz kit to test and review with my 7 year old son DJ. In the box you get the rivetz gun, rivets, rivet centres, card pieces and instruction manual. The set is recommended for children age 8 years plus and not suitable for children under the age of 36 months due to the small parts. The instruction manual is detailed and easy to read and follow and once built the hornet is 45cm x 30cm, It is easy to place on show downstairs or in the child's bedroom on the window or top of draws. The hornet has plenty of detail to it and looks amazing once completed. You can also purchase rivetz dragon and rivetz racer which I have to say also look really good. This is a product I would highly recommend to friends and family to purchase as a gift for christmas and birthdays, I have shown this of to a few friends who are really impressed with the item. What I also like is that once you have completed the product you can easily take it apart and re build it by your self or with friends. As you can see from the picture above, everything comes packaged well so that when you open the box you have no lose bits falling everywhere, which I think is fantastic, especially if you also have younger children at home with you. Me and DJ sat down in the evening to do this once my daughter had gone to bed and I was surprised by how much he liked it and how quite he was putting it together. DJ has said that he enjoyed putting this together and likes that he can take it apart when he wants to and build it again and show his friends how to do it, it was great to build it with my mummy their to help me when i got stuck, but after i did it with mummy, i tried again with my friend and didn't need any help at all. My mum and step-dad recently had a few days off work and promised the kids they would take them out for the day, I was asked if I wanted to tag along, but said no, I thought it would be nice for the kids to have some time alone with them, and also for me to get some peace, although I only ended up staying in and cleaning the house from top to bottom. The morning they left it was pouring with rain but DJ still wanted to go, but luckily once they arrived there the sun was shining. I was sent the monsuno strike sector combat set and cores to review with my son DJ who is 6years old, 7 next week. The monsuno strike sector combat set is aimed at children age 4 years plus and to be honest when we first got it and took it all out of the packaging I looked at it and felt really confused. The strike sector combat set includes 1 strike sector base, 2 launch ramps and 2 rails, the box we got also included a bonus battle bag. We also got the extra cores and another set which included figures, cores and cards. The strike sector set was easy to put together as you just needed to clip the rails in and open the base and put this down, so although at first it looked confusing it was actually really easy to put together and to share the cards, sort out the cores and figures it only took me around 10minutes. The game can be played quite quickly or can last for an hour or so, I do think it depends on how many people are playing the game. DJ has said that he enjoyed playing the game but it is not something he will play with often, but he likes how he can leave it set up as it is easier to play then and keep under the bed when not in use. I do think that some of the reason he doesn't like to play this is because you have writing on the cards and DJ is dyslexic and suffers with his reading so often has to ask for help which he doesn't like to do. Now I have to be honest and say that I do think it is expensive for what it is and for what you get and it's not something I would spend that much money on although I would let DJ spend his birthday/christmas money on it if it was something he really wanted. The geomag set is suitable for children age 5 years plus and contains 68 pieces all together, This includes wheels, magnets, ball bearings and more, The set we received also has some parts that glow in the dark, You can purchase this from http://www.flairplc.co.uk/ and from http://www.smythstoys.com/ for £24.99 which in my opinion is well worth it. The instructions that come with this are fairly easy to follow which is great for some one like me who can't seem to follow instructions, Although my son who is 7 didn't need them. When the geomag set arrived for me to review my son got really excited when he seen what it was especially as you can crash the cars and helicopter into each other without the worry that they will break as if these do come apart they are easy enough to put back together. I will admit that I struggled to put these together and started to panic so I sat with DJ and I pulled all the parts out and he sat their with pure concentration on his face as he put them together and within 15 minutes he had built the helicopter, admittedly the police car and jeep did take him slightly longer but he was quite happy to sit their doing it all. This is something I would purchase as a present for my son if he didn't have this set and will also be keeping in mind as a Christmas and birthday presents for friends children and family members, I think that the recommended age for this is the right age as it may be a little hard for anyone younger, DJ is nearly 7 and has enjoyed playing with this and putting it all back together and pulling them apart. In the picture above is the box when opened and the contents that come with it, the picture below is the helicopter after being built, unfortunately I don't have pictures of the others as they have been pulled apart again but I will add pictures of them in a few days when DJ has re-built them. I have asked DJ what he thinks of the geomag wheels set and this is what he has had to say. I have really enjoyed playing with this and putting it all together and smashing it all up and building it again as I don't have to worry about breaking anything and having my mummy shout at me and tell me off, My friends have been and played with this as well and they like it to, I like that it glows in the dark as it means when mummy turns the light of I can still play with them, I won't let my sister play with this though because I don't want her to lose any of the bits because if she does it might mean I won't be able to build everything together again, It was quite easy to do but mummy found it hard. I have not been paid to review this product but I have been allowed to keep the geomag set that was sent to me free of charge, Opinions in this review are mine and my son's. 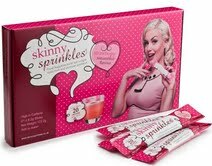 I have kindly been sent a box of skinny sprinkles by the wonderful Jane to review so as it is going to be around 2 weeks before I write up a review giving my opinion on them I thought that I would write a little about them and my weight now so that myself and my blog readers will know how much weight I lose whilst using skinny sprinkles. It is also recommended that if you exercise to have this 30minutes before and it will help you get more from your workout as they also give you extra energy. They do recommend though that you use with a weight loss programme or reduced calorie diet, These are also suitable for people who follow weight watchers as they are 0 pro points. To make these up is simple you just add the sprinkles to water and stir well, it then starts to thicken ready to drink, They contain glucomannan which is a special fibre and this is what helps the stomach to think you have eaten and fills you up. I have to say I am looking forward to trying these out and giving my full honest opinion, including before and after pics and weight loss in about 2 weeks time. I am 8stones 9lbs and have measured round my stomach and if I have measured correctly it is 35 inches. So from tomorrow I will be starting my skinny sprinkles along with some exercise and healthy eating, and will note down what I eat and what exercise I do and report back with weight loss and inch loss.